Easter being a time for candy of all sorts, we thought we’d take this opportunity once again to talk about some of our favorite Easter candy of all time: Reese’s Easter eggs! Hershey’s arguably best-known brand always knows just what to come up with to attract new legions of fans all the time, and the Reese’s Easter eggs shown above are no exception. First off, each box comes with 24 absolutely scrumptious chocolate peanut butter eggs that will make you salivate before you even take that first bite. 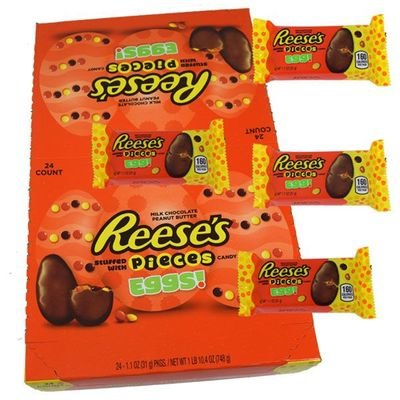 So there’s that, but Reese’s isn’t finished yet, because this variety of Reese’s peanut butter eggs comes packed with Reese’s Pieces. If you’ve never experienced this kind of deliciousness before, just imagine what you’re getting here. Twenty-four chocolate peanut butter candy eggs with crunchy Reese’s Pieces in every bite. Yep, that has us salivating, too! It’s okay to enjoy these before and after Easter, too, right? Just as an added bonus here, let’s talk about another Reese’s delight we have featured for Easter: the Reese’s giant peanut butter bunny! This is one pound of chocolate and peanut butter, an adorable, seven-inch-tall Easter bunny that will pleasantly surprise anyone finding it in their Easter basket this year. You owe it to yourself and your family, friends, and customers to pick up the gift of Reese’s chocolate peanut butter this Easter. And that isn’t even all we have. Explore all our Easter Reese’s offerings right now at BlairCandy.com!